Facebook Creates Save Feature, Because You Really Do Want To Read That Article Later – Right? Have you ever happened across your high school bestie’s highly anticipated new baby-filled photo album on Facebook, but didn’t have time to scan through 200 photos? But, alas, when you went back to peruse the site later you forgot all about that album, essentially depriving yourself. Apparently, that’s a problem (if you can call it that) the engineers at Facebook have found a solution to. The social media site recently announced on its blog a new feature called Save that lets you, ahem, save all those interesting things you see floating around your News Feed. Users can save links, places, videos, music and other things to a “for your eyes only” tab on the site for later investigation. If you really feel the need to show others what you’re putting off, you can share your saved items with your friends. The items can be viewed at anytime by simply going to the “More” tab on the mobile app or by clicking the link on the left hand side of Facebook’s site on a computer. The list of saved items is organized by category and can be archived once you’ve had your fun. And don’t worry about forgetting you saved something, either. 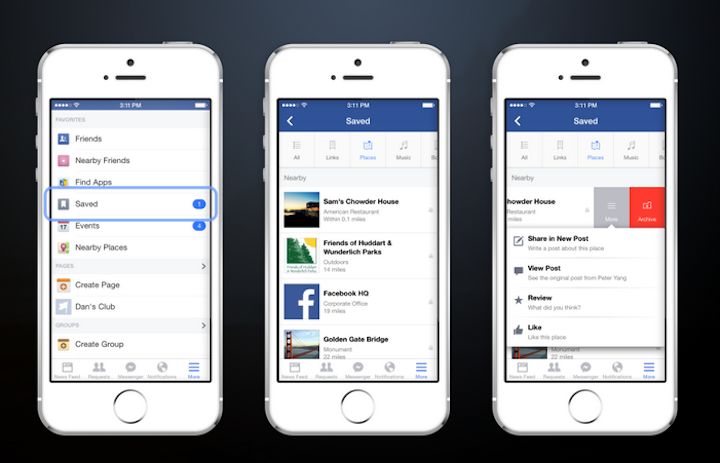 Facebook will periodically show users a reminder of their saved items in their News Feed. The new feature will be available on iOS, Android and the web in the next few days.